Have you checked out DCM Classics selection of rebuilt gauges? This 1953 Dodge Truck aka “Stella” was restored by our friends at Avondale Dodge Ram in Arizona. DCM Classics has moved away from the traditional cardboard style interior kits to an ABS material interior kit. Check out our full selection of gas tanks here. 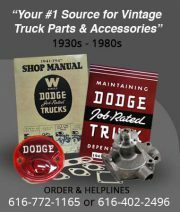 DCM Classics is now offering new reproduction emblems, officially licensed by Mopar, for 1946-1957 Dodge Power Wagons.